POLIURETANOS CAMARASA SL SPECIALIST IN THE INJECTION OF POLYURETHANE PIECES. 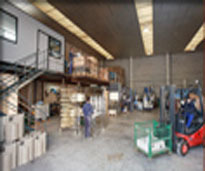 Policam, a company founded in 1999, is located in the Olerdola Industrial Estate, 1 km from Vilafranca del Penedés and only 50Km from Barcelona. Policam has its roots in composite expertise which later developed into the field of high performance polyurethanes (PUR). Based on the vision of working with the highest standards of quality technical polyurethane, Policam contacted Bayer. Validation of our equipment and technical expertise has resulted in a regular supply of Bayer´s materials and technical support required for the implementation of the productive process. Technological support is provided from the start of new projects. Aiming for quality, Policam invests in technology, purchasing high precision machinery capable of high outputs as well. The two foam machines available and owned by Policam can produce a broad range of weights, from small parts of only a few grams to larger ones of up to 20 kg with only one injection of material. With this aim, we have 5 presses, 2 of 70tns, 2 of 30tns and a smaller one of 10tns. Furthermore, we adapt the PUR polyurethane characteristics to the needs of our customer´s final product regarding elasticity and densities. Densities from 1.200 Kg/m³ with Baydur 110 (meeting V0 fire standard) to 600 Kg/m³, and more recently 200kg/m³, with Baydur 60 are possible. A wall thickness of 3 to 20 mm is feasible as well depending on the technical and aesthetic requirements. The aim of our company is to serve those companies requesting small to medium series for a part, with high technical and mechanical demands plus excellent finishing. We are specialized in medical and cosmetical casings, working for big representative firms in this sector such as Diagnotics Grifols SA, Ancar SA, Sorisa SA, Enco, SA., etc. The automotive industry has also showed interest in our products. Inmesa S.L. and Nissan, among others, trust our technical materials for different applications. Technical office (externalised for the main part of the products). Mould production (controlled from our technical department).